Winnipeg is known for its winters, cold and sometimes even brutal. Of course we experience some good weather too, in summer *and* in winter. A temperature of –25C or colder might look terrible to some, for others these temperatures are a relief from colds and sore throats. These ailments get no chance in winter here. 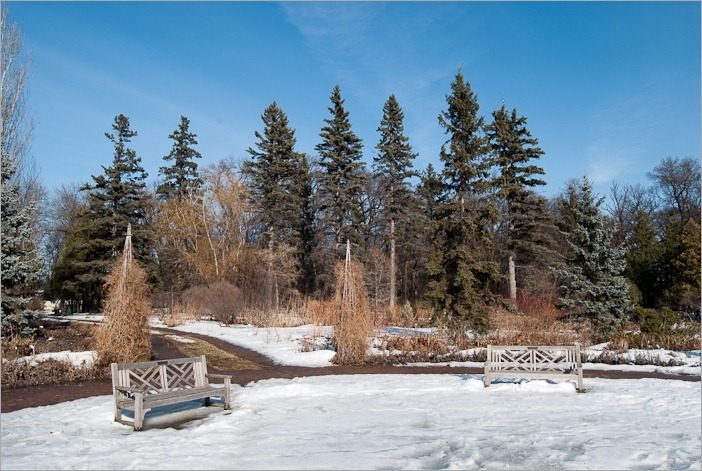 One thing for which Winnipeg is certainly not famous is its parks and gardens. That is a big mistake. 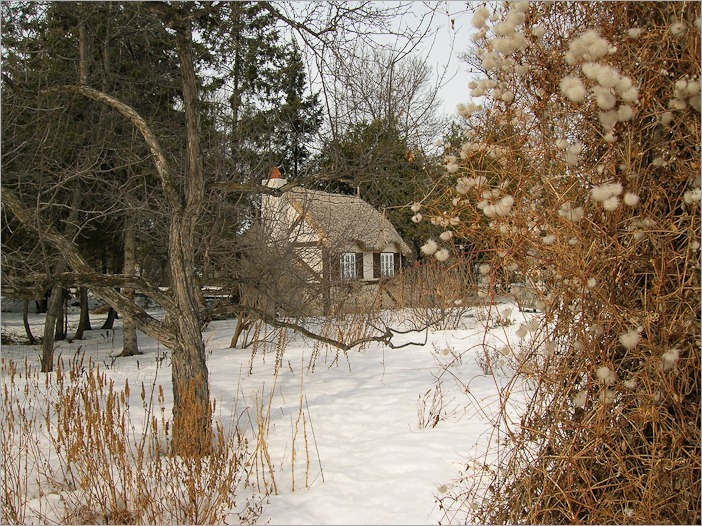 Many parks and gardens are beautiful in all seasons. 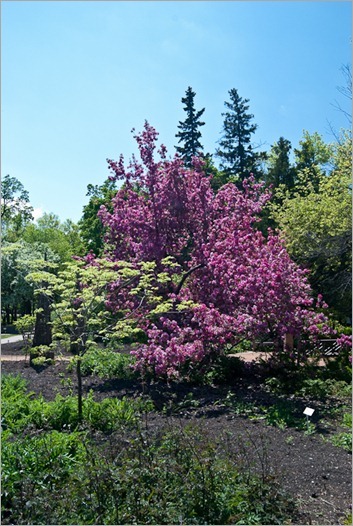 The garden that really comes to my mind is obviously one that is not too far from my house: The English Garden in the Assiniboine Park. In winter all garden plants and flowers are gone. Certainly in a winter like in Winnipeg. Obviously plants and flowers that are perennial in other countries will wither and die here. 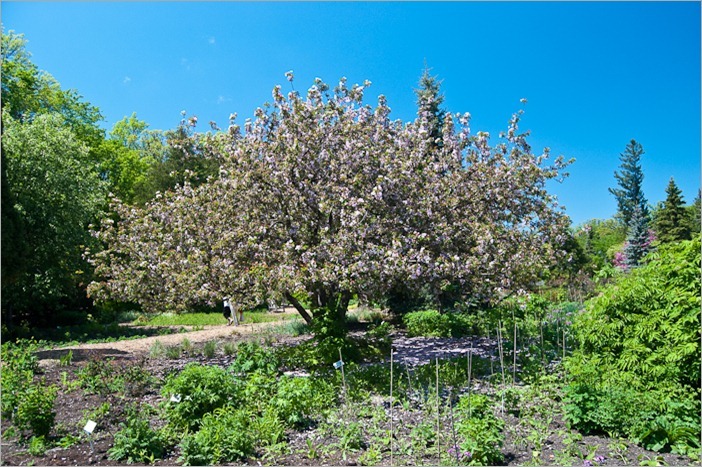 So to create a garden in Winnipeg you will need a solid knowledge of gardening and gardens. George Campion was a man with such knowledge. In 1923 he began his plans for the “Informal Garden” later to be called the “English Garden”. Probably because both the formal and informal style can be found in nearly the same spot. After four years of preparations and paperwork the real work began in 1927. In 1929 the garden was opened to the public. While the entry to the park is more formal with little stone walls and fountains, other parts will have a more informal aspect with flowers growing in clumps seemingly where they want. Don’t let yourself be fooled though. Everything is carefully planned and executed in the garden. When spring comes, and at last all the snow is gone, plants and flowers hesitantly show themselves. Most of them will have been replanted after the cold winter. 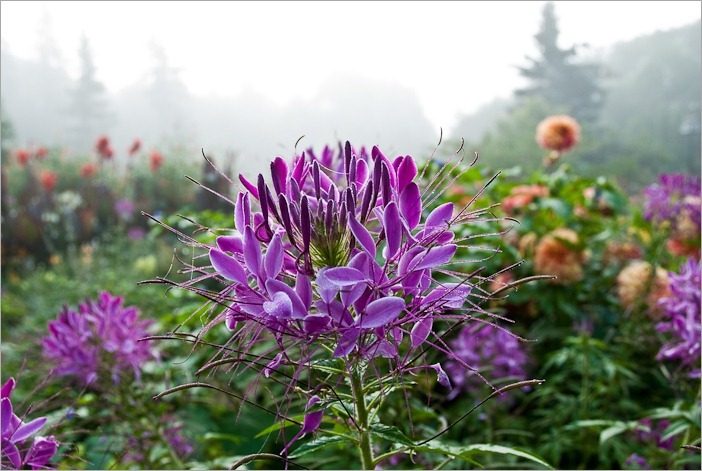 While in other countries perennials will be perennials, here they have to be replanted every year. 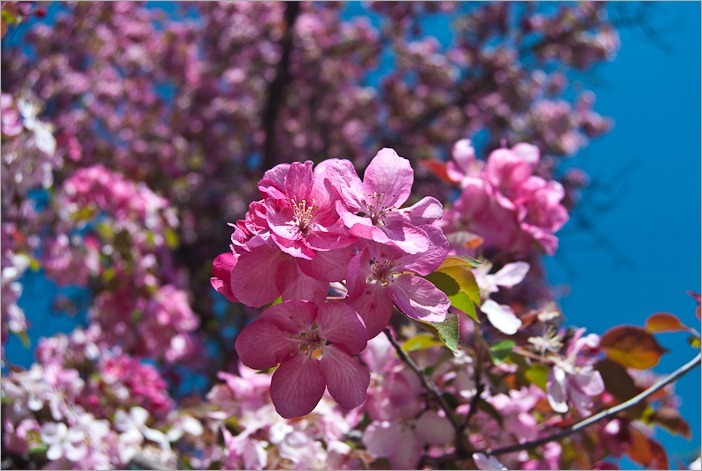 And when spring really comes, there is no way to cut down on the color. Everything flourishes and blooms. 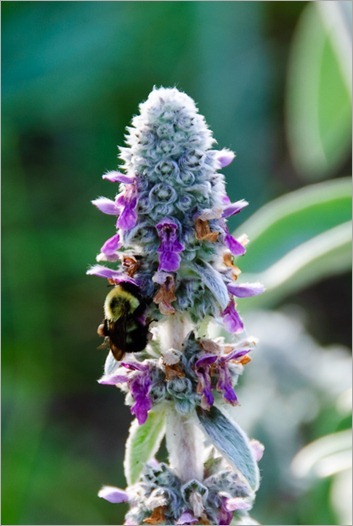 Of course the insects will also be happy to enjoy the new nectar and other goodies they might find in the flowers and plants. This little bee was taking its supper when I caught it with my 200mm lens. Not easy to take, the bee was quickly gone. Since this was around supper time, I think there must not have been a lot of the good stuff left for it. Lots of places to get the food for the new generation in the English garden. Of course I’m talking about the insects and the birds, not the human visitors. They will have to get their food somewhere else. All summer plants and flowers get planted and removed. There is not really a day when there is no work to be done in the garden. Looks like a nice job to me. And then, before you know it, Fall is knocking at the door with misty, foggy mornings and spider webs made visible everywhere. The remaining insects will be thankful for that. The photographers too. When I took this picture around 9.00 in the morning, I had to be careful not to catch fellow photographers in my frame. Of course, winter in Winnipeg is a way of life and we could not do without it. So I will end with another wintery picture. 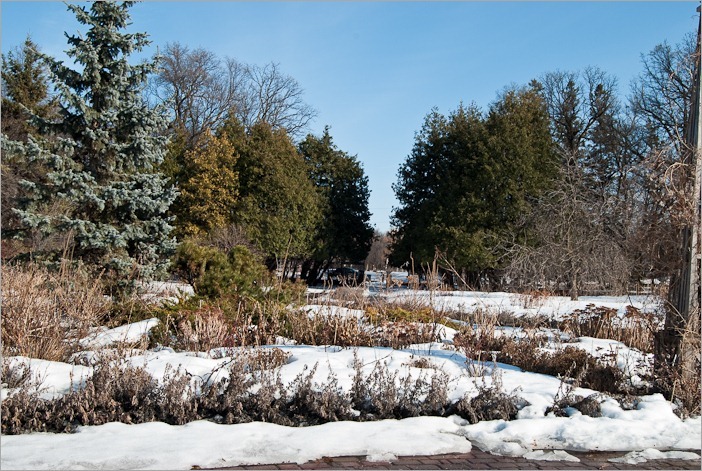 In case you have any doubts, the English garden in the Assiniboine Park is really worth visiting year round.